I have asked this question in a different way before, but I have an appointment with my hearing aid fitter next week, and I would like some input. I am using Kirkland Signature KS8 HA’s. The one in my right ear is working close to perfectly. The right is my better ear. In my poorer left ear I still have issues. I am coming to the conclusion that I am getting feedback through the vent holes in my vented sleeves. My thought is that I will ask for a closed click sleeve in my left ear to see if it will help. It should give me some improvement in feedback isolation. But, I am wondering if I should actually try closed sleeves in both ears. While feedback is not a big issue with my right ear, perhaps I would gain some noise isolation, and directionality by having both ears fitted with closed sleeves. What do you think? I currently enjoy very good bass with my stereo system with vented sleeves. My low frequency hearing is still quite good. Will I lose that bass if I go to closed in both ears? Any other possible downside issues? I have custom molds with select-a-vent. Right now I am using 0.6 to 1 mm vents in each mold. I don’t have much of a finger-in-the-ear sensation except, depending on the volume setting on my HA’s, when I speak, my voice sounds a little loud to me but you get used to that quickly. When I wear over-the-ear head phones, I still notice the increased bass relative to what my Quattro’s by themselves can produce. Perhaps if you were a definite audiophile, the difference an occlusive fit makes might be a big deal but I am not discerning enough to be bothered by any difference (I have pretty decent low-frequency hearing). On the plus side, an occlusive fit does a better job of trapping whatever bass your HA’s do produce inside your ear canals. If I were you, I would go for custom molds with select-a-vent and try stuff out yourself. The one irritation that I found with that is my left and right molds are different sizes because of differences in the sizes of my left and right ear canals and I was provided with two outside diameter sizes of vent inserts - but the exact same size vent holes inside do not seem possible, at least in the 0.6 to 1 mm inside diameter range, for left and right vent inserts. Don’t know about your Connexx software but with the ReSound Smart Fit software, one can easily run a feedback calibration test on either ear and see in the graphic display of the results how occluded each ear is with whatever dome or mold setup that one is trying. 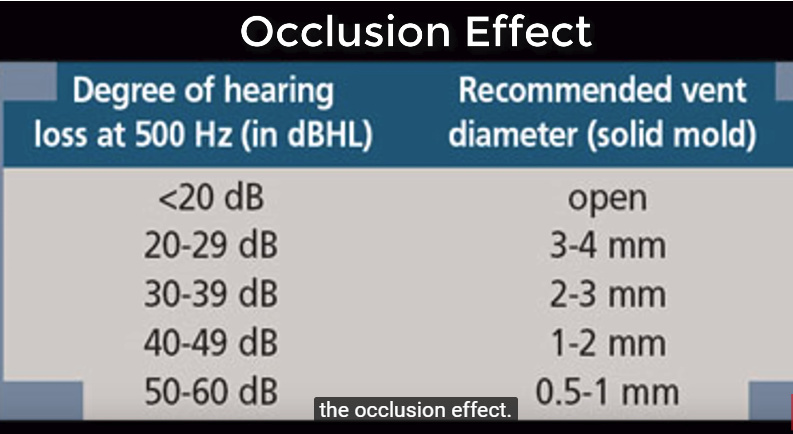 I have always found the results depicted in the graph closely mirror my own sense of ear occlusion or not and very useful in deciding whether my ear canals are really occluded as much as I want. The non vented sleeves are my last ditch attempt before I get serious about custom molds. I will keep your comments about them in mind if I go down that road. 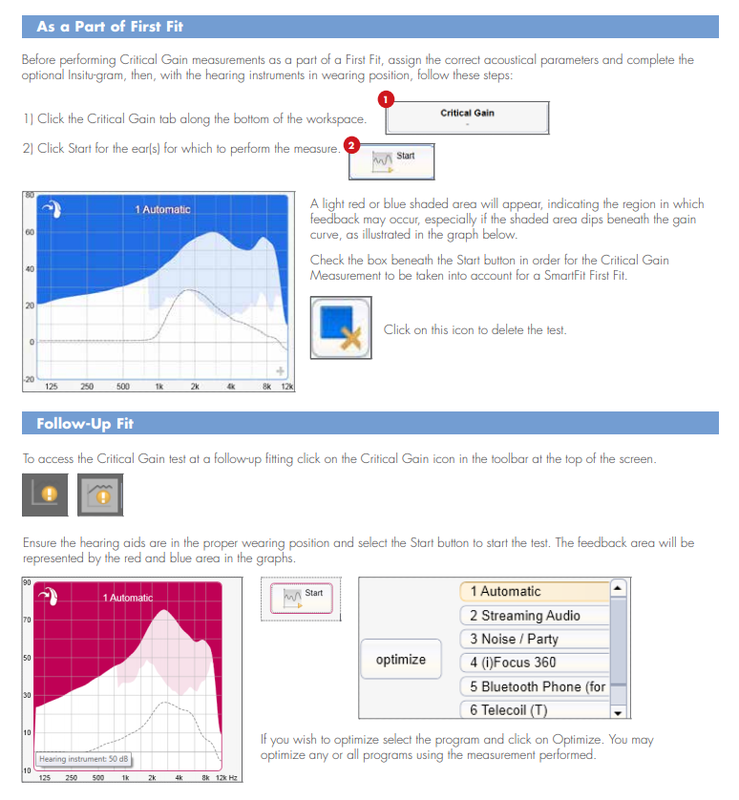 I can’t do much with the Critical Gain in the Connexx software while in simulation mode. Here is some info I clipped from a Connexx 7.5 tutorial. It seems there are two points that you can do the Critical Gain. One is with the First Fit after you have selected the type of fitting. I believe if you do it then, the software uses this to restrict gain to avoid feedback. The second point is when doing a follow up fit. It seems when used that way it can optimize gain based on feedback issues. Since we’re the only two people conversing in this thread, the forum “AI” is probably going to start nagging us about that. But my experience is because of irregularities in ear canal shape, I really couldn’t control occusion very well with domes, etc. A custom mold (as made by ReSound out of silicone) fits better, is more comfortable than some occluding power domes, tulip domes, etc., that don’t fit just right, is easier to clean, the receiver opening is more recessed and rarely collects any wax, and with the select-a-vent and feedback tests one can tune the degree of occlusion as much as one wants and change it at any time - it’s not a permanent decision. With the ReSound fitting software, one can run a feedback calibration test at any time, one can specify the type of ear insert and the size of the vent opening for custom molds, and one can tell the software whether to take the degree of venting into account in cooking up the prescribed fit. get custom molds… you will never look back. would you rather wear a one size fit all shoes or a customed sized pair made just for you? You aren’t get your money worth out of those aids and that audio-gram without custom molds. guys, get a custom molds and be done with it. you will never want to go back. Why do some of you folks insist on beating yourselves up over domes? Get properly vented custom molds and be done with it! I may be mistaken, but I think when Doc Jake was encouraging custom molds it was for people with significant low frequency losses. They’re certainly a possibility for anybody, but they really come into their own with notable low frequency losses. I would get properly vented custom molds and be done with it… sorry, but I just don’t get the fascination with open domes. unless you have a very minor loss with open domes you aren’t getting the full benefit of the aids. — Updated — I would get properly vented custom molds and be done with it… sorry, but I just don’t get the fascination with open domes. unless you have a very minor loss with open domes you aren’t getting the full benefit of the aids. So I think Doc’s message, which I thoroughly agree with, is that with custom molds and select-a-vent, you have much more control over the degree of occlusion, having very little occlusion (at least a 4 mm vent size) if you don’t stick in any inserts. I’m sure just like many other HA issues that it’s a YMMV issue. But I personally think the benefit of hearing incoming bass “naturally” by bypassing the HA’s is oversold compared to the possible disadvantages in loss of speech clarity, loss of HA directional function, and loss of noise control if you go with a very open fit. And a more occluding custom mold is supposed to work better at preventing bass sounds streamed to your HA’s from escaping your ear canal, too. So maybe streamed bass will be better even if “natural” environmental bass will suffer a bit getting to your eardrums. I doubt Doc Jake ever encouraged open domes, but I think he really pushed molds for people with more significant lower frequency losses, but my memory is very vague. I also think there’s a reason HA manufacturers, Oticon in particular, really encourage people to try open domes. Anyway, no harm trying it all and seeing what works. I know your pleased with your custom molds. I’m curious how effective they are at noise reduction in noisy places? I won’t comment about the effectiveness of molds, but I will say that they are more comfortable than I thought they would be. I fully expected the hard molds the VA fitted me with would be unbearable, but they aren’t that bad. They are vented with a fairly large vent. I am very sensitive to occlusion. I can see where having the sound from the outside blocked so the only thing you hear is coming from the aids might improve the performance of the aids. I have had problems with domes working their way out of my ears. It has happened once with molds, and I think that was because they weren’t inserted deeply enough to begin with. I am thinking of trying to have molds made for my Phonaks. And a more occluding custom mold is supposed to work better at preventing bass sounds streamed to your HA’s from escaping your ear canal, too. So maybe streamed bass will be better even if “natural” environmental bass will suffer a bit getting to your eardrums. When I tried the KS8 the closed click sleeves were the most comfortable, very little occlusion, and no feedback. They do have a small vent. Remember they must be oriented in a particular way and it is not intuitive and the drawing on the back of the pack is not helpful. I finally figured out the indicator (a dot I think) is closer to the front instead of the back. Yes, I asked the fitter about this when you cautioned me about it before. She said to put the little tab on the side that has the receiver type and wire length printed on it. 3M in my case. I’m curious how effective they are at noise reduction in noisy places? I find the molds even with a 0.6 to ~1 mm vent pretty good at blocking out external room noise. Our refrigerator/freezer when running makes a moderate droning noise and with the HA noise suppression cranked up to STRONG (not advised for speech situations), the HA’s can take out most of that noise fairly well, even more noise reduction if I turn the HA’s completely off. Same for using a mechanical toothbrush to brush my teeth(the external noise reduction makes the bone conduction component really stand out!). I can still hear speech at much reduced volume through the molds if my HA’s are turned off so perhaps whatever I can still hear in the above situations is just sound leaking in through the molds (and/or small vents). Sometime I’ll have to give completely occluding inserts a try and see how I like that sensation. I have essentially no feedback while wearing my HA’s but can induce feedback when the HA’s are out if I accidentally bring the receiver openings near a reflective surface, e.g., my ear lobe or the charger case surface. So if I’m understanding correctly, you have more noise reduction with your hearing aids off than with them on. How much difference is there between them in your ears but off, and not in your ears? I find too the best thing I can do in really noisy places is to turn hearing aids down or off. Yes, the external microphones are picking up the refrigerator noise and the noise suppression algorithm in the HA’s cannot completely subtract the noise - plus I still have whatever noise manages to leak through my small vents or the occluding mass of the domes. With the HA’s off, there is no microphone pickup, so I only have the latter two sound components. I guess if I try inserting the completely solid plastic tubes, I’ll have an idea as to how much sound actually leaks through the small vent bores as opposed to just traveling through the silicone. Trying to run feedback analysis with the vents completely blocked seemed like a questionable proposition. Intuitively, it should seem like there is no need to do it and I could just go with the feedback setting for the small vents I just swapped out. Seems to me that with any kind of reasonably closed fitting there should be a noise reduction in turning the hearing aids off, while they are still in your ears. I do it every morning when I run the coffee grinder. They are not as effective as using noise reduction ear plugs, but also not that far off. It is certainly quieter with the turned off hearing aids in, compared to no hearing aids at all. My expectation would be that the ear plug effect will increase with the non vented click sleeves. Just to see what it would be like, I switched to completely solid inserts for the select-a-vent on my molds - completely occluding. Doesn’t make a tremendous difference in sensation beyond having only 0.6 to 1 mm vents. Tad more occluding, tad more noise reduction relative to the slight venting I was using. The main reason that I see to remain with some venting is air pressure equalization. Just enter your correct audiogram software even in simulation mode will give coupler system it self. Then if you want proper grip and to get rid of ittching select mold it will automatically show vent size you done. But go for both ear and not one. I tried that and it gave me a recommended venting of 2.5 mm = medium SAV. That would seem to be more open than the closed click sleeves which are supposed to be equivalent to a 1.6 mm or Small. I just watched the Dr. Cliff video on selecting the correct vent size. The rule of thumb he presents is based on hearing loss at 500 Hz. My hearing loss at that frequency is 25 dB. From his chart below, this would seem to indicate a vent size of 3-4 mm which would be significantly larger than the 1.6 mm that the closed click sleeve is rated at. I am gathering using the closed click sleeve would invite a significant own voice occlusion effect. However, Signia claims their Own Voice Processing solves that problem, so potentially I can get away with a closed sleeve from that aspect. And the recommended vent size is only based on occlusion. My main issue now seems to be feedback, and I certainly have much more loss and required gain at those frequencies, so I should gain from a more closed fitting. Perhaps the only way to figure out what works best is to just try it and see? I just watched the Dr. Cliff video on selecting the correct vent size . It’s a multi-dimensional problem/decision and I don’t think a priori there is any way for a user to personally evaluate the importance of each factor to himself/herself and arrive at the optimum amount of venting that he/she prefers as opposed to just going with a population-derived value that’s supposed to work for you. As soon as I discovered that I could hear soft high-frequency speech more clearly going with more occlusion, the open vents prescribed for me were out the window. Same for ReSound’s proprietary comfort Audiogram+ fit profile vs. NAL-NL2, which gives more amplification to soft input sounds in the midfrequency range. If I decide to change volume, implement noise control, or change the relative balance of bass, midtones, and/or treble, since the sound I’m hearing is coming largely from my HA’s, the program changes are a lot more effective than if much of the sound I’m hearing is “natural,” bypassing my HA’s entirely and giving me no control over what I hear. Again, it’s an individual preference that may apply to some like me and maybe not a lot of other folks. P.S. And if you have select-a-vent, you can vary the vent size for special occasions. You don’t have to be stuck with the “optimum” size (for what?). Going to a concert and want to hear as much natural deep, deep bass, go with more open inserts. Motorcycle racing like GreatDane (or just using a horribly noisy mower), close it up and don over-the-ear protection besides.